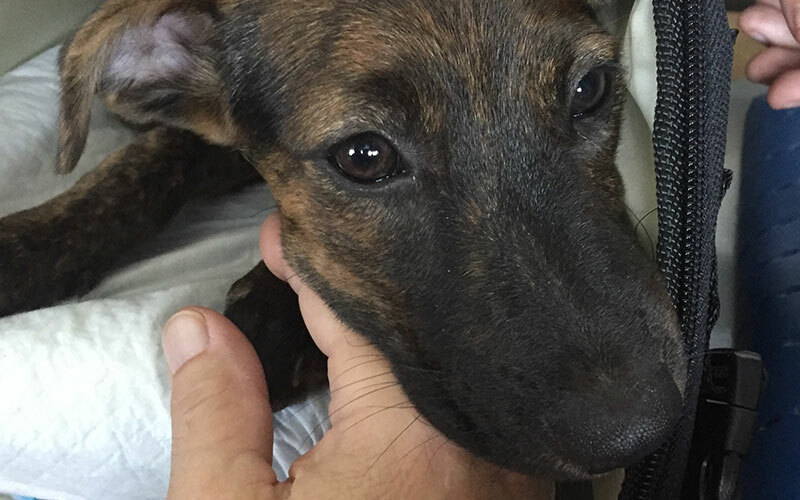 Due to Aruba’s small native population, New Life for Paws (along with the other rescue foundations) looks to the United States in order to find good homes. They offer an “Aruba flight volunteer” program in order to facilitate the adoption process. Tessa had signed us up to be flight volunteers by contacting NLFP directly about a week prior to traveling to Aruba. Their website is currently being reworked, so the best way to contact them if interested is through the AFV Facebook page. The puppies are welcome on most airlines on direct flights from Aruba to a city with NLFP Foster volunteers (Boston is a very popular destination for the puppies!) . A New Life for Paws member, Natalya, met us in the Aruban airport on the day we left. Natalya works full time for NLFP and physically rescues the puppies from the streets and abandoned buildings around the island. She is one of the most amazing people we had the pleasure of meeting! Alto, the rescue pup we transported to the U.S.
NLFP took care of getting the dog the necessary vaccinations, tickets, and paperwork in order to fly on the plane – as well as gave us an airline approved carrier, water, and puppy pads for the trip. We had absolutely no issues at the airport, had a lot of fun, and got to play with and hold a super cute puppy on our trip home. Since the puppies are so small, they board the plane with you and sit in their carrier under the seat in front of you. A member of NFLP met us at baggage claim inside of Logan airport to bring the puppy to his forever home. The best part was that he was adopted almost immediately upon arrival to the United States! After volunteering to fly a puppy home, we began following NLFP’s Facebook page, which is where they post pictures of all of the puppies available for adoption. After seeing a picture of a puppy that we instantly fell in love with, I began the adoption process. The adoption application took about ten minutes to complete – the application can be found on the NLFP Facebook page or by contacting any of the NLFP members through the Facebook page. The next day, I heard from one of the founders of NLFP directly asking me further about our interest in adopting the puppy and about our living arrangements/schedules/dog experience, etc. The adoption fee was $500 – that included reimbursement costs for his medical care in Aruba, transportation costs, reimbursement costs during his fostering, and a small donation to NLFP. It was determined that we would be a good fit to adopt the puppy, and I went to New York to pick up Whisky (then Lukie) 2 days later – and surprised Tessa with him at our apartment doorstep! But before arriving to all the hugs, kisses, and toys, Whisky’s future wasn’t looking so bright. New Life For Paws received a phone call from an Aruban resident that a female dog had taken shelter underneath her porch and appeared ready to give birth. She informed NLFP that she would alert them when the dog birthed the puppies. Some time later, the resident called NLFP stating that the dog gave birth to female puppies and that NLFP could come and pick them up for treatment/adoption purposes. Natalya, one of the NLFP members, drove to the resident’s home. Natalya found the mother and her puppies laying in a dirt patch without food or water. Natalya noticed that in addition to the three female puppies, there was also one boy that they were previously unaware of. A surprise to Natalya, the resident who’s porch from where the puppies came was waiting at the terminal when Lukie arrived for his flight to U.S. She asked to hug him as she never had before. Lukie gave the resident a thank you kiss for allowing him to find a good home. Natalya and the resident both waved goodbye as the flight volunteers took Lukie into the terminal and onto his next adventure. Whisky has been everything that new dog owners could have asked for. He was house trained by the age of four months, has never been aggressive, and always has the most adorable smile on his face. He has a very calm personality and is able to come with us for walks around the city, for car rides, and vacations. We love him so much and are so thankful for NLFP doing what they do in Aruba! You can even follow Whisky’s adventures on his very own Instagram and see just how lucky this pup got! 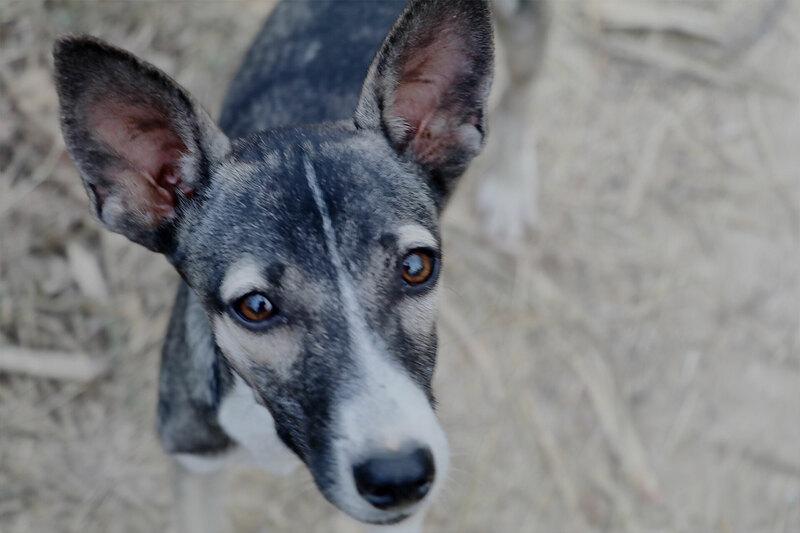 New Life for Paws has been working for years rescuing puppies from malnutrition, tick infestation, and the scorching heat. They assist in neutering the adult dog population and finding suitable homes for the newborn puppies. For more information on becoming a flight volunteer and transporting a puppy back from Aruba, visit the Aruba Flight Volunteers Facebook Page. If you’d like to consider adopting an Aruba puppy, learn more and reach out to the crew at the New Life for Paws Facebook Page. The NLFP website is currently under development, but at some point in the near future, you’ll be able to visit newlifeforpaws.org for even more information.